Can you send me a standardized test question that is JUST PLAIN IDIOTIC!?!? Texas State Representative Gene Wu recently sent this around to the folks at the Texas State House. I believe it is a 2012 4th grade Texas STARR test question. At first I couldn’t decide what category to put it into – but yes, it is the first “idiotic” question. What digit 4? And what’s with that new coin? This really is one of the most idiotic test questions I have ever seen. What digit 4 are they taking about, indeed! I think that “new coin” is supposed to be a Roosevelt Dime (assuming that is the coin you are talking about) which, by the way (if minted before 1965), is worth $2.10 in silver and copper scrap – so start collecting those little beauties! I was thinking about the showing of both Lincoln’s head AND his memorial to represent a penny. Since when did standards become accountability? I agree that this question is idiotic. However, I would say the answer is b. The money amounts to five dollars and 34 cents. Here the “4” represents cents. The conflicting answer is c, where the 4 represents dollars. To me, it doesn’t seem very difficult, but still absurd. It’s not so much that it’s a difficult question as in how it’s presented. Why are two versions of a penny shown? 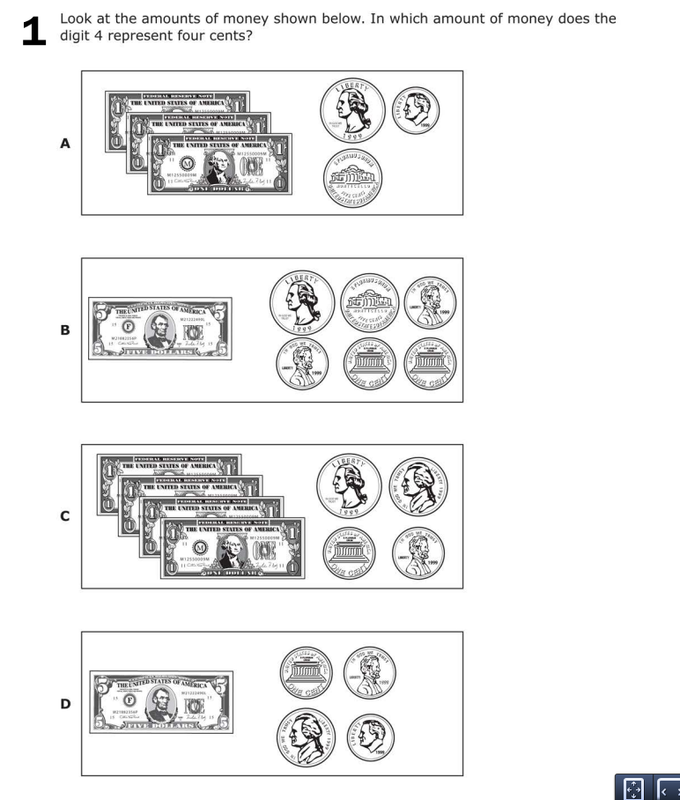 Is this a test of a kid’s ability to recognize coins or to show understanding of place value? I agree that the answer must be B, because that’s the only answer in which any digit represents 4 cents. . . but what is “digit 4”??? There are only three digits in $5.34, unless you count the decimal point as a “digit,” but that’s obviously idiotic. Plus whoever refers to digits that way? I’ve been enjoying the rest of the error-ridden questions on this site, but this one is actually something that students in 4th grade should be comfortable with. All of the coins shown look just like the ones in my pocket, and digits and place value are how students and teachers talk about math at an elementary level because it is part of fundamentally understanding how numbers work in base 10. You might not remember this if you’ve tuned out your elementary math lessons, but that doesn’t make it a bad question. My only thought on this is that my 1st grade students could answer this, so I’m not sure why it’s being asked on a 4th grade test!